It was, without question, one of the greatest sporting events I have ever witnessed. Why am I using so many commas? DISJOINTING, ISN'T IT? But this is the blueprint. 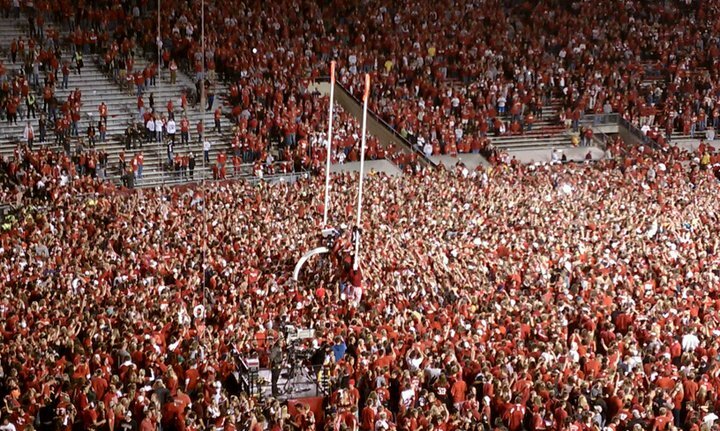 This is the motivation and the reason we BELIEVE that we can overcome being 10 point dawgs at home and beat a team that is objectively better at football than Wisconsin. No one who has watched these teams so far this year would say with a straight face that UW is better, or even that these teams are evenly matched. OSU deserves to be 10 point favorites on the road in a night game at Camp Randall. That Urban Meyer is really good and annoying! But if you know me, you know I've already convinced myself that we can hang with them. And despite all the injuries, a BUMPIN' Camp Randall can tilt the field in our favor. Screw it. Let's party on the turf all night and light those goalposts on FIRE. CHICAGO BADGERS: Good luck getting the UW game on a TV at any bar other than a Wisconsin bar Saturday night. Who knows, maybe Will's will even have the Badger and Cubs games on. What a time to be alive.